The innovative art school franchise concept now operates eight schools in five states with over twenty-five more locations planned for development. We are really excited about providing a compelling career opportunity for arts educators. Having said that, this can also be an amazing career opportunity for people who want a really fun job within the “business of the arts” and you don’t need a background in arts education to run a school or open. It is hard to open and build an art school. Try doing it coast to coast. That was the ambition of One River School and they have now fulfilled their promise. The company recently opened locations in suburban Chicago (in Evanston, Illinois) and suburban Portland (in Lake Oswego, OR.) When combined with the three new units in the metro New York area, One River is quickly becoming one of the fastest growing education concepts in the country. “I am so excited about our ability to enter the Midwest and Pacific, Northwest” said Matt Ross, Founder and CEO of One River School. When we find compelling professionals who are looking for a new career opportunity and a fantastic business opportunity, our franchise program allows them to bring One River School to their community”. One River School has developed a proprietary method for teaching art and design to all ages. The company has also combined it with best in class training, marketing, facility design and support to assist operators in building and managing their schools. 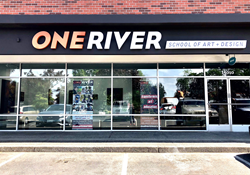 As One River School expands it seeks to become “the best place to work in the arts”. Ross says: “We are really excited about providing a compelling career opportunity for arts educators. Having said that, this can also be an amazing career opportunity for people who want a really fun job within the “business of the arts” and you don’t need a background in arts education to run a school or open a new franchise location”. The company is moving forward with an aggressive development plan that combines opening company-owned units supporting franchise development”. “We love the business and will open as many schools as we can”, says Ross. In addition, when we find someone who loves what we do and has the skill to launch it in their hometown, it's a win-win situation and that is where our innovative franchise program kicks in”.